I know how terrible it can be to go through a raw sewage backup or spill. The apartment right below my office at my first property management job had a sewage backup the day before I started. However, there is more this problem than the odor. You have questions about dealing with sewage backups, and I have answers. What Exactly Is Raw Sewage? Raw sewage is the sewage that has not made its way back to a wastewater treatment plant. Anything that you flush down the toilet is what you will find in raw sewage. This untreated water could be classified as grey water or black water depending on how hazardous it is, and it should be avoided at all costs. What Are The Classifications Of Raw Sewage? As stated above, raw sewage is typically classified as grey water and black water. Grey water is what goes down your shower drain or the drains in your sink. This water does not look as menacing and does not smell as bad as black water. Black water can be anywhere from dark brown to black depending on what it contains. You can imagine what is in black water, and it is dangerous to be around. The health risks of exposure to raw sewage are various. You will come into contact with viruses, bacteria, a range of germs and even parasites that thrive in that environment. If you come into contact with raw sewage, you should seek medical attention immediately just to make sure that you have not picked up a virus or parasite. What Causes Raw Sewage Backups? These backups are caused by a number of factors. Septic tanks can fill up quickly and back up because they run out of room. I have seen backups in spaces where the outgoing pipes were clogged, and there are times when the wastewater treatment plant backs up and causes a backup in homes or businesses in the area. What Protective Measures Do Professional Take? 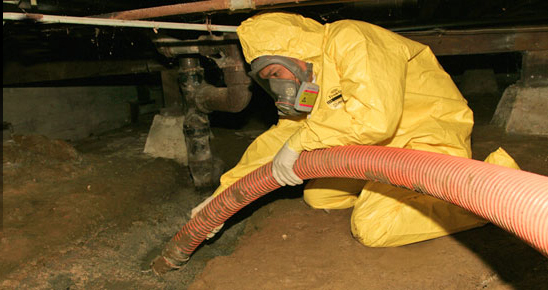 Professionals who clean up raw sewage will wear hazmat suits and breathing masks. This equipment helps prevent the attachment of parasites or the inhalation of any kind of airborne virus. When I saw my first sewage backup, the city water system was called out to the scene. Plus, a sewage cleanup crew was called to the scene. The city crew handled the clogged pipe while the cleanup team removed the sewage with drying equipment. I also watched as the cleanup team sanitized the entire apartment to prevent parasites and viruses from lingering. When you have a sewage backup, you need to get any valuable items out of the way and out of the house. Your children and pets need to be sent to a friend’s house for their own safety, and you may need to evacuate the premises if the backup gets out of control. You must call for help immediately and let the cleanup crew do their job.